On a recent visit to south-central Ohio, I needed to find lodging for just one night. We were headed to a college campus for a visit and tour with my son and would be out the door early in the morning. 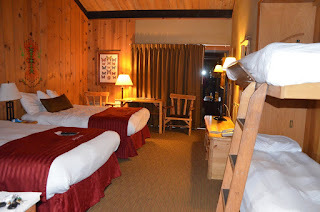 I have loved staying at lodges in state parks. The setting is so much more serene and peaceful than a Best Western situated next to an expressway exit. Unfortunately our drive to Ohio lasted all day and got us there well after dark, so we didn't get much of a chance to see the grounds. I'd love to visit again to spend more time in this beautiful park when the weather is warmer, the days are longer and there's time to explore. The lodge was renovated in 2012 and has the amenities you'd expect at a family lodge and some that would definitely be absent at a roadside express hotel. The grounds include a restaurant and bar, indoor and outdoor pools, game room, fishing, canoe and paddleboat rentals, tennis, volleyball, basketball and other fun activities. I've always been one who enjoys getting a birds eve view whenever I can. I love seeing Chicago from the top of the Willis Tower (Sears Tower to longtime Chicagoans) or the John Hancock Center or the ferris wheel at Navy Pier. I loved flying over Niagra Falls in a helicopter. I enjoyed dining at Nick and Nino's in Springfield from the 30th floor. If there's a tourist destination somewhere up in the sky that gives me a great view, I'm all over it. 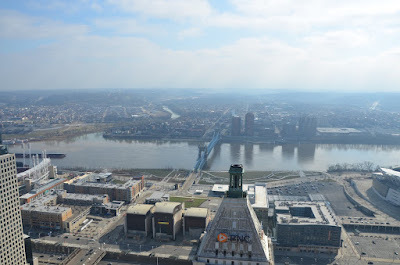 So, when I was traveling through Ohio last month and decided to spend a couple days in Cincinnati, I was excited to see that there was an observation deck at the top of the Carew Tower where I could look out at the Cincinnati skyline, the many bridges that cross over the Ohio River and the river towns in Kentucky. I took a recent road trip with two of my boys to Ohio. My 17-year-old will be graduating from high school this spring and was interested visiting Shawnee State University's campus in Portsmouth, Ohio. So, we were there for just a day and spent most of that time touring the campus, but should it be where he ends up going to school the next four years, it's an area I'd love to explore more. 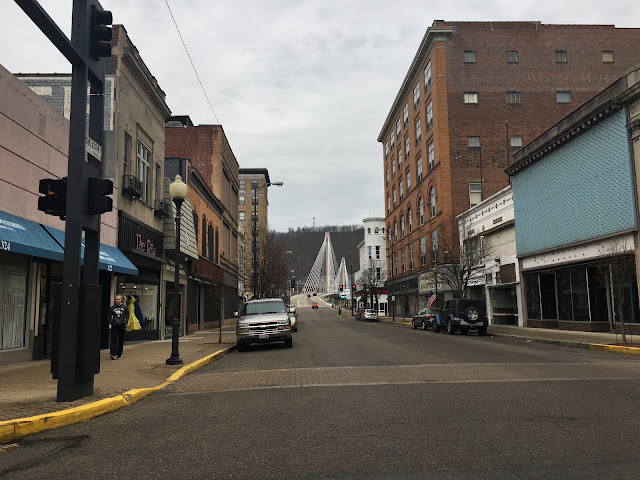 Portsmouth (which I understand is pronounced Portsmith by locals) is situated in the Ohio River Valley in Scioto County in south-central Ohio. The campus sits just along the Ohio River with a pretty view of the Kentucky mountains on the other side. The U.S. Grant Bridge is a beautiful structure that can be seen as you make your way around the downtown area. The town's Historic Boneyfiddle District is known for its antique shops and dining. The flood wall murals artistically portray the history of Portsmouth and was declared the largest continual work of art by a single artist.